A writing workshop for poetry, all forms and styles, will be conducted by Jeff Streeby MFA, in the Hart Community Center on Saturday, November 10 from 9:00 a.m. to 1:00 p.m. Please register by calling the library or by emailing librarian@hartpubliclibrary.org. Jeff Streeby, a Pushcart Prize nominee and a nominee for Sundress Press' Best of the Net Anthology, holds a Master of Fine Arts degree in poetry from New England College in Henniker, New Hampshire. He is a frequently published mainstream poet whose work has appeared in over 40 literary journals in the US, the UK, Ireland, and Asia, including Contemporary Haibun Online, Haibun Today, Naugatuck River Review, Rattle, and Whiskey Island. 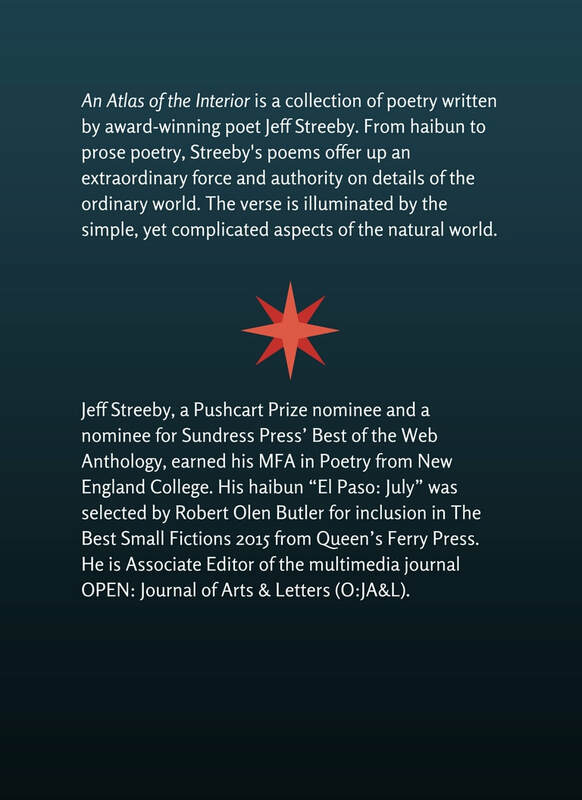 His haibun "El Paso July" was selected by Robert Olen Butler for inclusion in The Best of Small Fiction 2015 from Queen's Ferry Press. ​​An Atlas of the Interior is a collection of poetry written by award-winning poet Jeff Streeby. From haibun to prose poetry, Streeby's poems offer up an extraordinary force and authority on details of the ordinary world. The poems are illuminated by the natural environment of rural settings. ​"Farmington: August," a haibun featured in the collection, was nominated for a Pushcart Prize and for Sundress Press’ Best of the Web Anthology. Its companion piece, “El Paso: July,” also a haibun, was selected by Robert Olen Butler for inclusion in The Best of Short Fictions 2015 published by Queen’s Ferry Press. Unsolicited Press has accepted for publication in 2017 my poetry collection An Atlas of the Interior. More on this later. in Volume 13, #1 (April, 2017). in Volume 11, #1 (March 2017). reprinted from Haibun Today (2016) and Hobble Creek Review (2010). in Issue 3 (Spring, 2017). Haibun Today accepted “Conibear” and a version of “Truck Stop” for Volume 10 #2 (June, 2016). Haiku Presence accepted a version of “Landscape with Clouds” for Issue #55 (2016). Modern Haiku accepted a version of “Near Walkerville” for Volume 47.1 (Summer, 2016). Whiskey Island accepted “Flat Set” and a version of “Blind Set” for Issue Sixty-Eight (Summer, 2016). ​Jeff Streeby is "Featured Writer" for January, 2016 at Contemporary Haibun Online.